Comments: Vultures are sometimes mistakenly referred to as buzzards. This species is called "turkey vulture" because their bare, red heads resemble the heads of wild turkeys. In flight they are easily recognized from the V-angle (dihedral) in which they hold their wings. Recent research has indicated vultures are more closely related to storks than hawks. Their nests are located on the ground in rocky alcoves, hollow trees and in abandoned farm buildings. 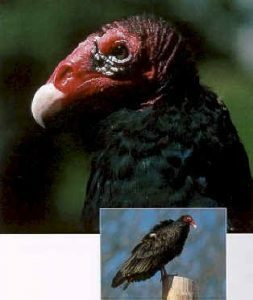 Young turkey vultures have black heads and are sometimes mistakenly identified as black vultures. Distribution: Turkey vultures are commonly seen soaring overhead throughout Kansas during the warmer months of the year. They are found throughout the United States and most of South America. Food: Turkey vultures can find food by smell. They commonly eat road-killed animals, either freshly killed or sun-ripened. Birders call turkey vultures “TV’s” so squashed animals then become “TV dinners”!